If you have forgotten your password, don't worry. Click here and we'll send it to you. 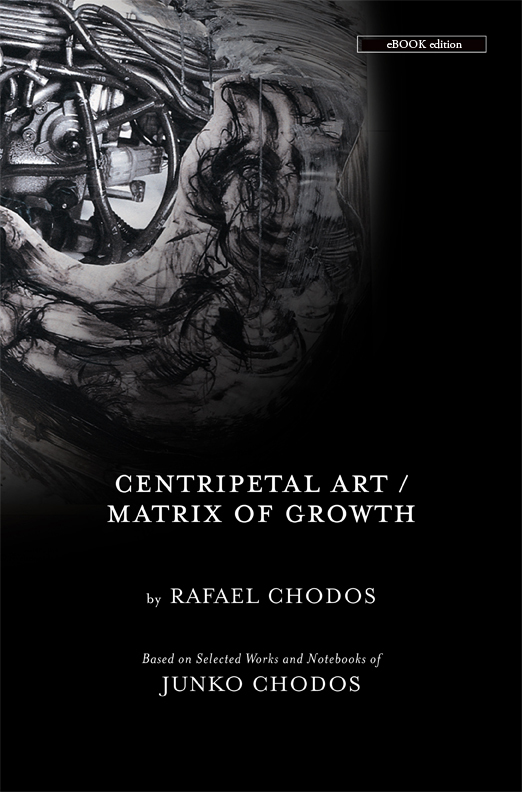 A book that shows how art can move from the soul of the artist to the soul of the viewer. 360 Pages - hardbound. 7.25" wide x 11" high. Beautifully printed. Like the eBOOK below, from which this is a "spinoff," this book addresses issues of spirituality and multicultural marriage, as well as art history and analysis. Purchase price here includes free copies of the three animations below -- available here ONLY. The book only is also available on Amazon.com. 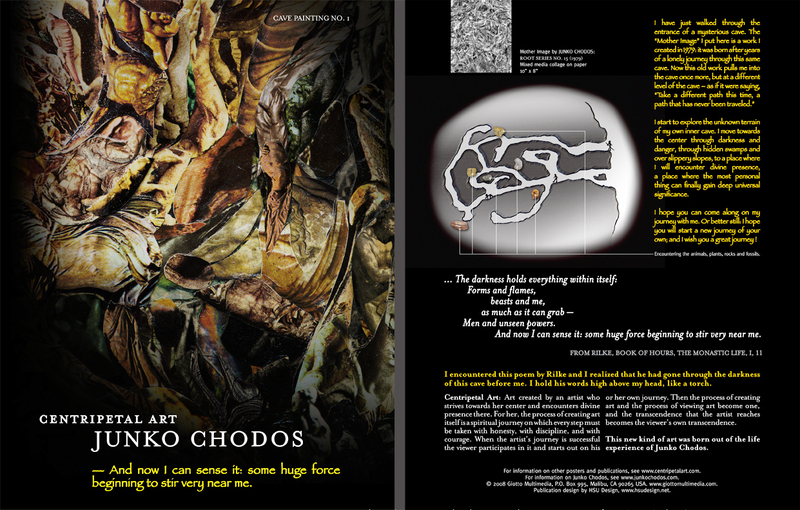 This is a selection of pages from the full eBOOK. Check it out: it gives the "look and feel" of the real thing! NO NEED TO PAY: this is FREE. This is the eBOOK with all features: you can read it online; subject to the copyright license and for your own use, you can PRINT pages from it and you can SAVE it to your own hard drive so you can read it offline. While you are ONLINE, you can participate in the supported NOTES-based discussion forum: you can make your own notes and read others' notes, and you can respond to their notes. You can SHOW all notes, or HIDE them, as you wish. The first work in Junko's Kuukai series shows Kuukai entering the forest. 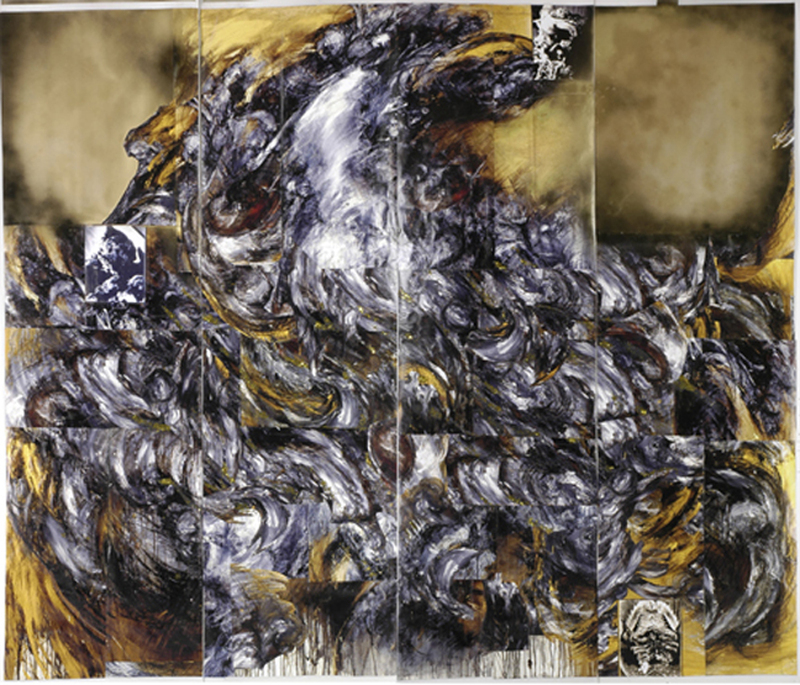 The original set of foreground panels is 10 feet high and 10.5 feet wide, made of a collage of computer prints layered onto mylar! Kuukai spent three years in the forest atop Mt. Kooya, eating rocks to absorb their special powers, swinging from trees and meditating. This animation shows him fighting with an unseen adversary - to HEAVY METAL ROCK that you won't believe. (Strapping Young Lad, from Century Media!) 2 minutes long, and downloadable to your iPOD. The second animation in the KUUKAI series: 3.5 minutes long, downloadable to your iPOD. Kuukai comes down from Mt. Kooya and his destiny calls him to journey to China. The journey to China is very dangerous: at that time, Japanese boats were not designed for stormy seas: they still had flat hulls! Most of the young men who journeyed to China died in shipwrecks. Kuukai's boat was shipwrecked but he made it to Chang'An - the biggest city in the world at that time, at the eastern end of the Silk Road. There he studied Esoteric Buddhism and returned to Japan carrying copies of all the most important Buddhist sutras - a boat full of scrolls! Back in Japan, he started to spread his own teaching: Shingonshu. The central message was: We can erase our karma in this one lifetime. We don't have to be born and reborn hundreds of times to reach enlightenment. This message blew the minds of all who heard it, and Shingonshu is still the most popular Buddhist sect in Japan today! 2-minute animation, downloadable to your iPOD. This short movie features the last events in Kuukai's life: He told his students it was time for him to go into his final meditation at the top of Mt. Kooya. This was over 1100 years ago, and his students say he is still sitting there, lost in deep meditation. Each year they carry oil lamps up the mountain; and still now, every day, they leave a small bowl of rice and a cup of hot tea for him as he sits, invisible, on the mountaintop! -- The final animation in this short series of three. 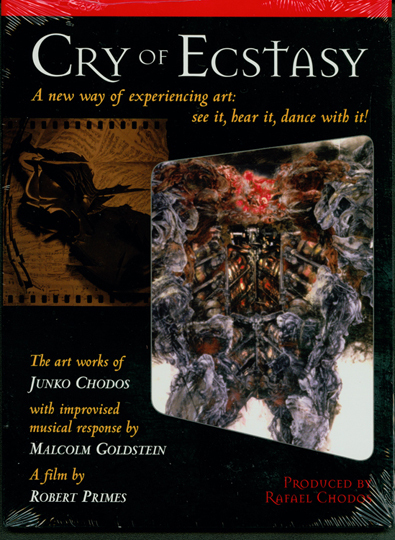 DVD featuring nine of Junko's works. While they were hanging in a museum, violinist and composer MALCOLM GOLDSTEIN responded to them by improvising on his violin. Those moving improvisations were recorded professionally. Two years later the award-winning cinematographer ROBERT PRIMES responded to the music and the art by rephotographing the same works in Junko's studio. THE RESULT: no words, no people, just breathtaking art, music, and cinematography encountering each other in a MAGIC SPACE. 22 minutes total. Original work of art: collage on paper or acrylic on kromekote. Work must be selected from Junko's site, Works For Sale. Shipping free within the United States, please purchase item CU0001 which includes $25 extra if shipped overseas. Work shown is example only: specific work should be identified in the order, and we will confirm availability and shipping data promptly. 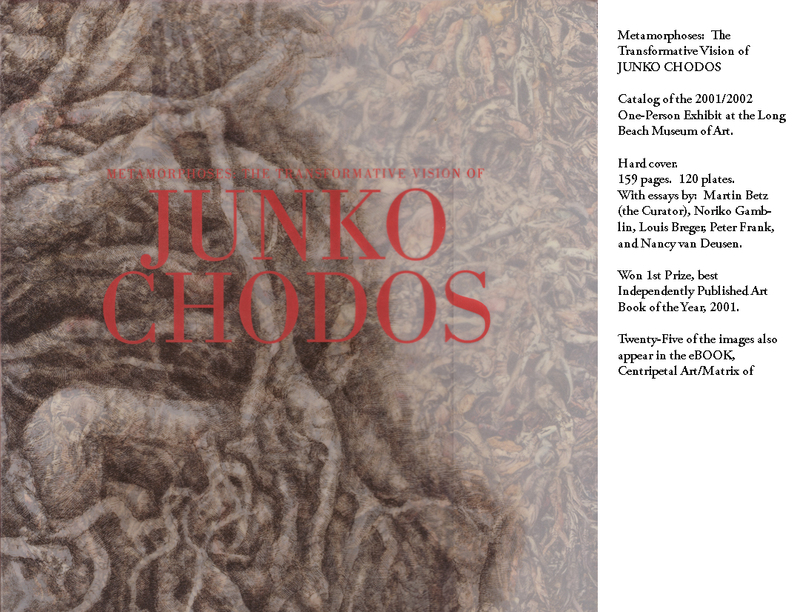 You should identify the particular work you want on Junko's website, JunkoChodos.com Works For Saleand order ITEM CU0000 if your shipping address is within the US, otherwise use this item - and $25 shipping will be added. You should confirm with support@centripetalart.com that the particular work you want is still available, before ordering. We ship overseas with three days of receipt of your order. 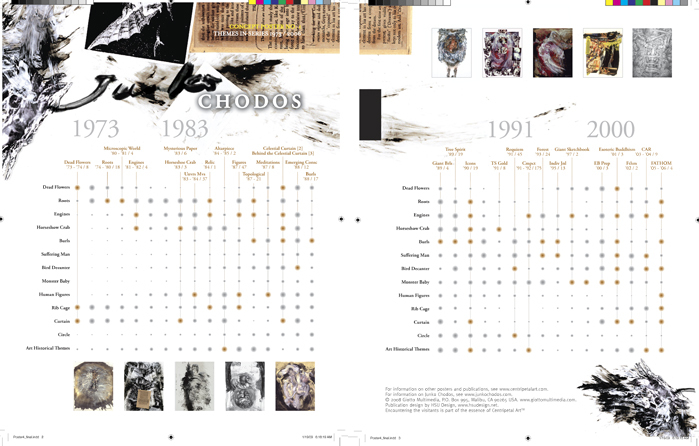 This chart lists the "visitants" that have inspired Junko's art, and for each visitant, lists the series of works in which it plays a part. This edition of the chart starts in 1973 and ends in 2006. It is an amazing document, because it shows the persistence of the artist's encounter with her themes. "Thinking laminate." A laminated notebook-sized double-sided page, with an image and poetry - it thinks, and it makes you think! The image on the front page comes from an early collage, and there is a powerful quote from Rilke. You can frame it, or 3-hole punch it and keep it in your notebook. Another "Thinking laminate." 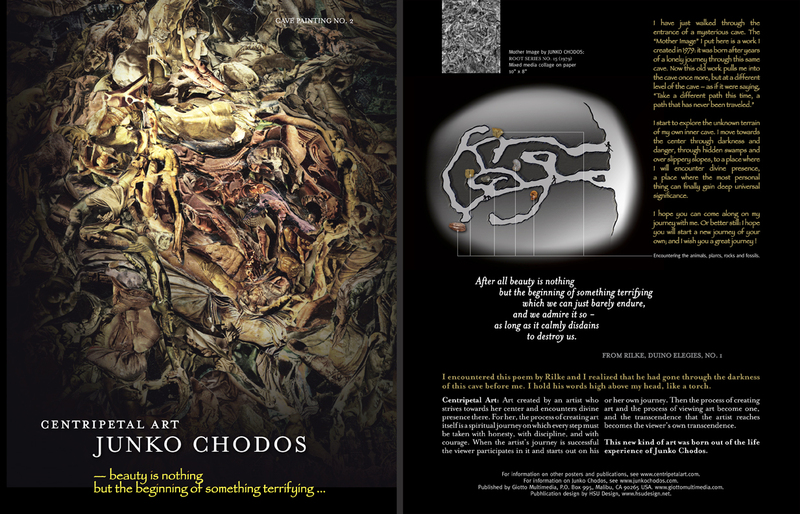 A laminated notebook-sized double-sided page, with an image and poetry - it thinks, and it makes you think! The image on the front page comes from an early collage, and there is a powerful quote from Rilke. You can frame it, or 3-hole punch it and keep it in your notebook. This product comes from the same collage, "Root Series, No. 15" as Cave Poster No. 1, and is a good companion product. 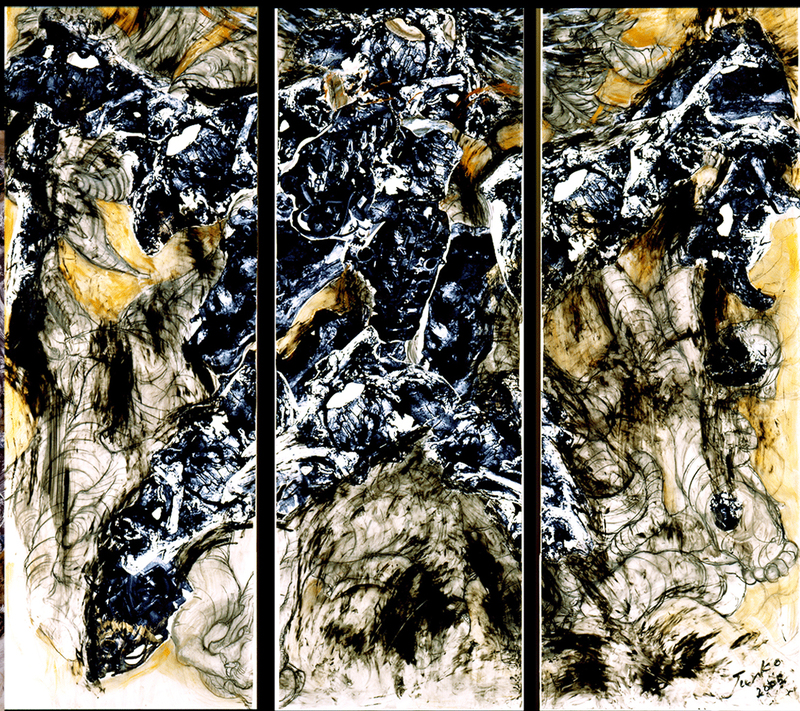 This "thinking laminate" derives from one of the works in Junko's 1993 series, Individuation Journal, No. 7 (1993) titled Fall of Man. The work includes a quote from Erich Fromm, Man For Himself, in which he addresses the question, "What was man's real 'fall'?" 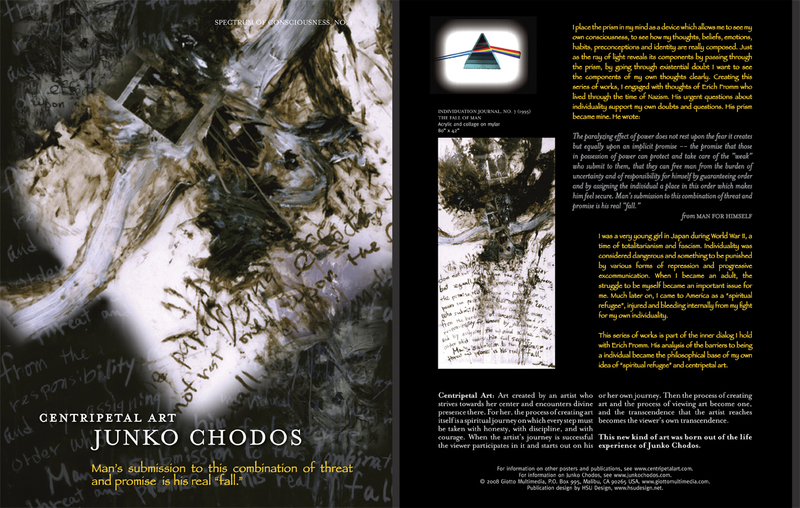 His answer makes us think and Junko's art, which is part of her inner dialog with Fromm, makes us think even more! If you are interested in purchasing original art works, please send an email to the artist directly, at support@giottomultimedia.com. The Gallery page shows works that are not for sale. © 2019 Giotto Multimedia. gBOOK and CentripetalArt are trademarks of Giotto Multimedia.